Descriptions This is another version of Johny Magstore template for blogger store with invoice email. But you can use this template for Paypal payment. 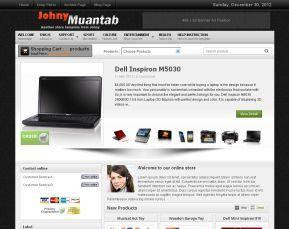 Johny Muantab template was made especially for online store with invoice payment method. Design with magazine style blogger template with 3/5 column blogger template and 1 column siderbar in left, 4 column footer, shopping cart with invoice email blogger platform, automatic featured content slider, ads 468 x 60 px ready, pagination for blogger ready, dropdown menu, zooming image, clean design template, and more. This template designed for online store only with daily updates. If you have any problem in downloading then contact us at 0323-7591466.